Most gardens experience a glorious burst of growth during the warm, sunny days of summer: Opportunistic leaves invade any available negative space. Flowers reach to the sky. Squash seem to double in size overnight. And though it’s fascinating to watch this transformation, the favorable growing conditions of summer can also introduce problems for plants — including bolting, pests, diseases, and heat stress. But by following the steps below, you can ensure your garden stays healthy and fruitful for months to come. Plants have a simple, singular goal: make more plants. This fact is perhaps never more apparent than in summer — when they flower and produce seed. In the case of fruiting crops, such as tomatoes and peppers, this process is good, because you eat the part of the plant that holds the seeds. But many other crops, including most greens and tender herbs, taste bitter and die soon after going to seed, or bolting. And of course, dead plants = no more food. So here are a couple of solutions. Temperature, day length, or plant age may trigger bolting, depending on the crop. And it’s ultimately unstoppable. But you can delay it by pruning, which is really nothing more than cutting back plant growth. As a bonus benefit, pruning also helps control pests and diseases by keeping plants from getting overgrown. More on that in a moment. Even with regular pruning, your plants will eventually reach the end of their life cycles. That’s why strategic gardeners practice successive or staggered planting — which is when you plant a round of replacement crops while your current crops are still growing. This provides you with an uninterrupted flow of fresh produce. When one plant peters out, you’ve got another one in the queue, ready to go. Johnny’s Selected Seeds has a handy chart to help you pace your seeding intervals. It’s during summertime that you get to enjoy the yields of most fruiting crops, such as tomatoes, peppers, squash, cucumbers, watermelon, eggplant, and others. You’ll get to enjoy them, that is, as long as they get pollinated. If you’re not noticing a flurry of bee and butterfly activity around your plants, try hand-pollinatingand growing a variety of flowering crops (e.g., those listed here) to make your garden more hospitable. Tower Tip: A well-fed garden is a productive garden. Don’t forget to give your plants all the nutrients they need. One of the most deflating experiences for a gardener has to be discovering that pests or diseases have demolished your crops. Fortunately, it’s an experience you can avoid with a little effort. As warm temperatures wake up your plants, they do the same for bugs. And there are a few bugs most gardeners wish would never wake up. Aphids are a great (terrible?) example. According to one journal article, certain species can hatch up to 41 generations of females in a season. And then those females can in turn produce billionsof offspring. If humanity ever ends due to nuclear fallout, I’m pretty sure aphids will survive. Then, they’ll infest whatever vegetation is left. But I digress. And as I mentioned before, pruning can also lower the likelihood of pests by making it harder for them to spread or establish their headquarters among your plants. You can learn more about smart, all-natural pest control techniques here. But generally, the treatment of most plant diseases is the same: Carefully remove any infected vegetation, and keep your plants well pruned to improve air circulation. For extreme cases of fungal diseases, you may also have success with foliar sprays commonly available at garden supply stores. Tower Tip: Going on vacation this summer? Use this checklist to take care of your garden before your trip. Most people begin to feel a little miserable when temperatures swell to the 100˚F range. Plants aren’t much different. Also keep in mind that some plants can tolerate heat better than others. For example, amaranth is a green that thrives in hot weather, while most of its leafy cousins prefer cooler conditions. For additional info, check out these seasonal recommendations on which plants to grow. 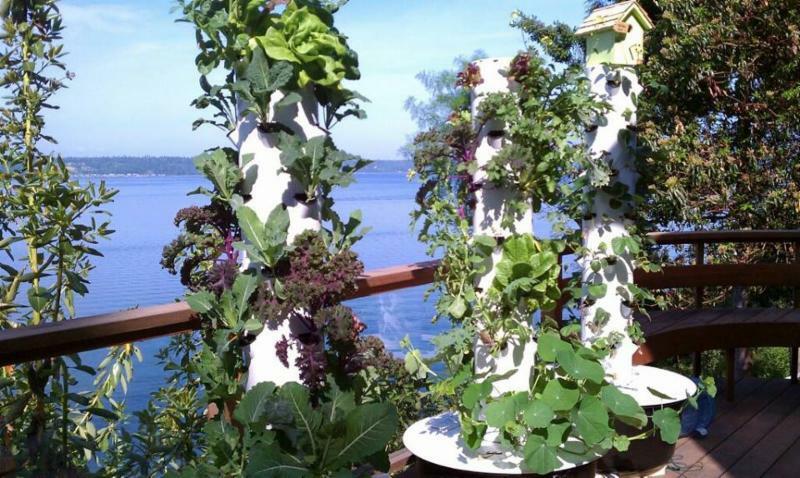 Tower Tip: During hot weather, water evaporates from your Tower Garden more rapidly. To counteract this and prevent the nutrient solution from becoming too concentrated, add Mineral Blend every other time you fill your reservoir (or every time at half-strength).